Although many of the website owners are still not aware of the use and need of breadcrumbs for running website smoothly, it always has a standard placement between the primary menu and the content. The most important feature of the breadcrumb is that it helps the user to know their location on the websites. The elements available on the extreme left in the breadcrumb trail are of the higher category. If the visitor wants to track back or want to track their navigation to find the relevant research result breadcrumbs help the user and save their search time. This leaves a positive impression on their mind and increases the chance of conversion and sales. When to Use Breadcrumbs Navigation? 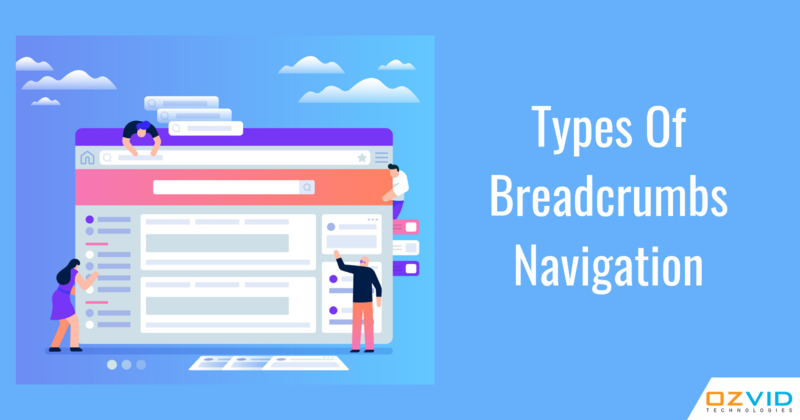 If you are still confused and want to know that whether to use breadcrumb navigation features in your website or not then the best way is to create your site map that represents your site navigation structure. A well-defined site map will help you in analyzing its need. If you are having a website similar to an e-commerce website that involves multiple pages and contains a large amount of content arranged hierarchically then it is good to use the option in designing your app. However, it might not be useful in single-level websites having an illogical hierarchy or grouping of content. Although the primary function of breadcrumb navigation in the website is to offer a great user experience by helping them in locating their current location on the website, there are three different types of breadcrumbs that got their name on the basis of function they perform. The feature of each of the breadcrumb is discussed below. 1. Location-based: As the name suggests, these type of breadcrumbs are used to represent the site structure that helps the user to locate their current position on the website. Thus it helps a user to understand and navigate the site's hierarchy that has multiple levels. This is highly beneficial to the one who digs deeper into your website. Thus it enhances the user experience of using your website which results in improving your website ranking on search engines. 2. Path-based: Path-based breadcrumbs are also called a history trail which is used to represent the entire path that the user traveled to reach their final page. But since there is more than one way to reach the particular page, most of the time it puzzles the user. Thus it does not offer much help and most of the time is replaced by a Back button. For Example: While searching for laptop bags on the e-commerce website you follow one of the following paths to generate the same search result. 3. Attribute-based: These type of breadcrumb displays your location on the site in the form of meta information. Accessing this kind of breadcrumb does not necessarily take you back on the path you came from within the site navigation. It can include keywords to gain on-page SEO benefits but because of its tendency to represent your location on the website, it has some usability issues. This makes this type of breadcrumbs least accessible. These breadcrumbs offer a seamless user experience and therefore if yours is a complex website with multiple pages it is good to look for the designer team like the one of OZVID. It has a proficient team of designers who are skilled in introducing this navigation feature on your website. Still having doubts, contact us anytime and get the best solution for all your queries.